One conditioning method used by the Scientistic Dictatorship Elite (SDE) to manipulate the population into accepting greater and greater levels of slavery have been through the use of "panic" and "fear." ALEX JONES has been a cynical and knowing, or ignorant and gullible agent of this strategy. When the June 28th 2012 Roberts SCOTUS Precedent happened I immediately sounded the alarm to my very small audience. There was silence about the damage of the decision as the NeoCons painted this horrible death blow to The Constitution as an act of genius on Robert's part, to destroy Obama Care - I could not believe the blindness. The only well known names who told the truth were Bill Whittle and Alex Jones. I had ignored Alex Jones for years. NEVER ONCE listened to a single broadcast. But I occasionally shared information with him under one of my many "a.k.a"s.
As you can see, I probably wrote too much about it. 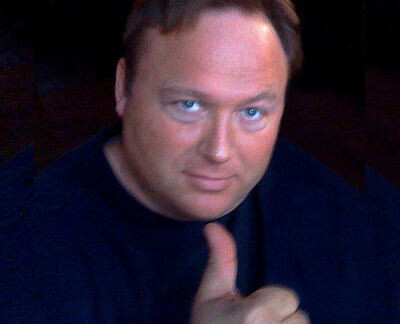 The bottom line is having ignored Alex Jones for many years, occasionally sharing information with him, I actually started listening to him and doing some research. The research has left me convinced that ALEX JONES is either an operative for the S.D.E., or a greedy dupe of the S.D.E. I was never "friends' with Bill Cooper, but we shared some mutual friends, and meet first in 1971. I very much respected his experience and curiosity. He walked a little too close to the White Supremacist crowd for me, and held some anti-catholic, anti-jewish views with which I cannot agree. But the bottom line is that Bill Cooper was a gentle and good man and honest to a fault. Our differences were two fold, based upon his ignorance (and probably mine as well). (1) He read the "The Protocols of the Learned Elders of Zion" and more or less took them at face value - as have many Orthodox Christians in the world. What he failed to grasp is that the Protocols are a forgery, but yet TRUE. This book that came out of the bowels of Czarist Russia, is a coded book of survival wisdom. It uncovers a great conspiracy of wealth and power, which aims to enslave humanity in a New World Order. The Russian Monks who authored this book, in the 1880s dare not speak the truth plainly; they would have been executed, or sent to Siberian Labor Camps. The "Learned Elders of Zion" are actually the Theosophical/Sophian/Luciferian/Illuminati, who at the time controlled Russia, were the power structure of the Russian Orthodox Church, the Vatican and of all of Europe. When you drain "The Protocols" of the anti-semitic code-cover, every word is TRUE. (2) The second point of diversion between my militia acquaintance Bill Cooper and myself was his view of Catholicism. For him every Catholic was a threat. He could not comprehend the difference between the Orthodox Catholic Faith, and the great wisdom it contains and the power structure of International Vaticanism and the second Rome - Moscow. I know from experience that for instance the divide between the "faith of Southern Baptists" and the CIA/co-opted Southern Baptist Missionary Board are two different things. Now you Baptist don't come at me - I'll tell stories you don't want told. The CIA has used the SBMB as a propaganda "in country" arm for many years - first hand experience - I know what I'm saying. Anyway, despite all that qualification - Bill Cooper is speaking from the grave, warning people of who ALEX JONES really is. Knowingly or unknowingly - that is really unimportant except to Alex himself, but he has FUNCTIONED as an operative of the SDE's New World Order, to desensitize the population through a constant production of "panic broadcasts." Read again: to DESENSITIZE the population so that when the country is really taken down, NO panicked voice will be believed. ALEX JONES has created a living, by creating panic, by false reports that to this date are too numerous to catalogue. One would think that having announced an all out nuclear attack upon the U.S. by the Russians launch of intercontinental ballistic nuclear missiles; a false and stupid Y2K report - a conditioning ploy that was not real and did not happen. . . that, that would be enough to discredit him. YET, young people under 50, who are of a Constitutionalist and Libertarian bent, especially the Paulbots thinks his words are GOSPEL. WAKE UP! YOU ARE BEING PLAYED. First time I met Bill Cooper was in 1971, the man was NEVER a liar. He was mis-informed and for a period of time bought into the Malthusian "Population Bomb" theory, like Newt Gingrich bought into the Global Warming mythology of a short time. Both Newt and Bill Recovered. - Bill Cooper from the grave nails the reality of Alex Jones. To gauge the veracity of the fellow who's words you count as Gospel - you need a little history lesson? Notice that Soviet Pilot 805 REALIZED that the commercial airliner flight 007 was no risk. He actually flew in front of the plane, which would be suicide had the 007 flight been a danger to him. He KNEW IT WAS NOT A RISK. The CIA and KGB cooperated to assassinate my friend Congressman Larry McDonald. Since THAT date I have had NO illusions about what I'm dealing with. When Larry McDonald appeared on "Crossfire" every KNOWING person knew that the setup was false; that BOTH questioners were agents of the Scientistic Dictatorship Elite - pressing for the destruction of American Sovereignty and the American Constitution - in favor of The New World Order. Yet, there was Pat Buchanan playing the loyal conservative, when in FACT, he was an agent for the NEOCONS - AND THE NEW WORLD ORDER. You Idiots, who think that the likes of Sean Hannity, Bill O'Reilly, the drug hazed degenerate Rush Limbaugh, Alex Jones, Glen Beck and the like have YOUR back . . wake us and smell the feces; or maybe your own rotting mind. NO "personality" gifted with fame is NOT a part of the forces who are TAKING YOU DOWN. Congressman Larry McDonald had the knowledge to destroy them - little wonder they killed him. The ONLY reason I am not dead is that I pretended that I didn't hold the same knowledge and danced for my life. I cannot name all the people I have known who have died under suspicious circumstances, or by the overreach of the police state - NONE who were criminals, but ALL who were lovers of LIBERTY. One was a close friend and sitting U.S. Congressman. When congressman Larry McDonald was assassinated by the CIA/KGB (the same power structure - WAKE UP!) to save my life, I threw a Stolichnaya Party at the home of my mistress, and invited every political person I knew. I had to "act" or die. In attendance was Trevor Getty the chargés d'affaires of the British Consulate in Atlanta and his mistress. Also, concert artist Madame Buday and her husband, who was a protected ex-Nazi monitored by the FBI; the officials from the Goethe Institute in Atlanta, President Carter's advisor Hamilton Jordan, Robert Shaw the Music Director and Conductor of the Atlanta Symphony Orchestra, James Laney and his wife (James was president of Emory University, an intelligence officer and future ambassador to Korea), just to name a few. It was a night like out of a scene from Casablanca, where most of the people there were innocent, but some were deadly. I honestly think that that night saved my life. Even though my heart was wounded with grief, I celebrated Larry's death, and played the hedonistic buffoon so convincingly I was allowed to live. Wake up people this isn't checkers. At the time I had infiltrated The Council On Foreign Relations, 13 years attending the local meetings. I was in touch with the John Birch Society, though I NEVER joined. I acted as a "party of one" I never joined anything. But I was awake and listening and recording what I was hearing.